Alfa Laval Gamajet tank cleaning machines have transformed frac tank cleaning from a dangerous time consuming task to a money making activity. In recent years, the booming fracking activities in North America have included thousands of trailers and hundreds of frac tanks, per day – and they all require regular cleaning. Cleaning these vessels between jobs can be a major bottleneck. The manual method of cleaning takes too long, is dangerous and in many regions, requires too much already scarce labor. Ideally, the cleaning process is efficient, minimizes effluent, and reduces confined space entry to a minimum. For this reason, oilfield service companies large and small are turning to Alfa Laval Gamajet tank cleaning machines. The biggest challenge is the geometry of frac tanks. The overall size is consistent but other features such as openings, drop pipes and flat versus corrugated sizes vary widely. Openings often do not allow for simple cleaning access to the entire tank. Alfa Laval has worked with a variety companies to develop a simple but effective method of cleaning frac tanks through a series of trials and demonstrations. Typically the disposal sites or yards have most of the equipment as part of their existing operations, so capital expenditure is limited to miscellaneous hardware and pump, which is typically less than $20,000 including the tank cleaning machines. Alfa Laval’s tried and tested approach includes a single tank cleaning machine on a cart, placed at one end of the tank, using a rigid pipe to position the cart in the tank (see pictures below for examples of carts and lances). The unit is placed at one end of the tank, runs for a period and pushes further up in the tank. Since a smaller area is cleaned in each position, a lower flow can be used. The number of cleaning positions varies depending on the model of the tank cleaning machine, whether it be the dual nozzle Alfa Laval GJ 8, the triple nozzle Alfa L aval GJ 4 and the quad nozzle Alfa Laval Toftejorg TJ 67. In addition, various flows and pressures depend on the model being used. Each unit has advantages for different types of residue and pumps. The result for oilfield service companies across North America? The machines perform beyond expectations. They allow the frac tank cleaning process to be shortened from 3—7 hours to 45— 60 minutes. The inside tank cleaning usually requires one person to position the machine, who can also clean the exterior or do other tank maintenance tasks concurrently. The machines also accommodate the re-circulation of the cleaning fluid, either water or diesel— reducing overall waste disposal. The bottom line is a tank wash facility with the most efficient tank cleaning process, implemented with minor capital and labor expense while providing a comfortable new revenue source. 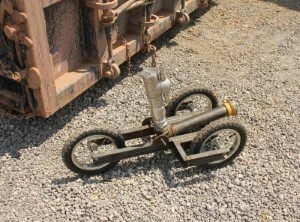 Trailer owners also benefit by faster turnaround of their equipment.